Before you can work with the images on your Windows 8 tablet, you need to be able to view the images. 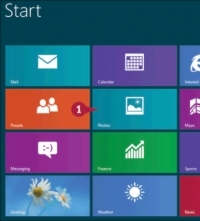 You do that by using the Photos app to open the Windows 8 Pictures library, which is a special folder designed specifically for storing images. 1On the Start screen, tap Photos. 3Tap an album, or an individual photo. Items in the Pictures library with names are albums that contain multiple images (A). Items without names are individual images (B). Once you tap, the album or photo appears. 4To scroll through the photos in an album, open the album and swipe left. 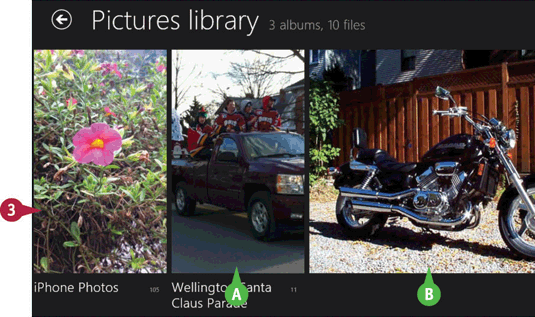 Each swipe tells the Photos app to display the next screenful of images from the album. Repeat this step to continue viewing the album images. To return to the previous screenful of images, swipe right. 5To view individual images, open the album that contains them and tap the first image you want to view. 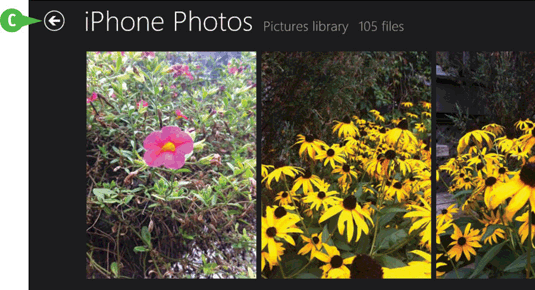 The Photos app displays the image. Swipe left to see the next image. Swipe right to return to the previous image. 6Tap the back arrow to return to the previous section of the Photos app (C). This takes you back one screen per tap.